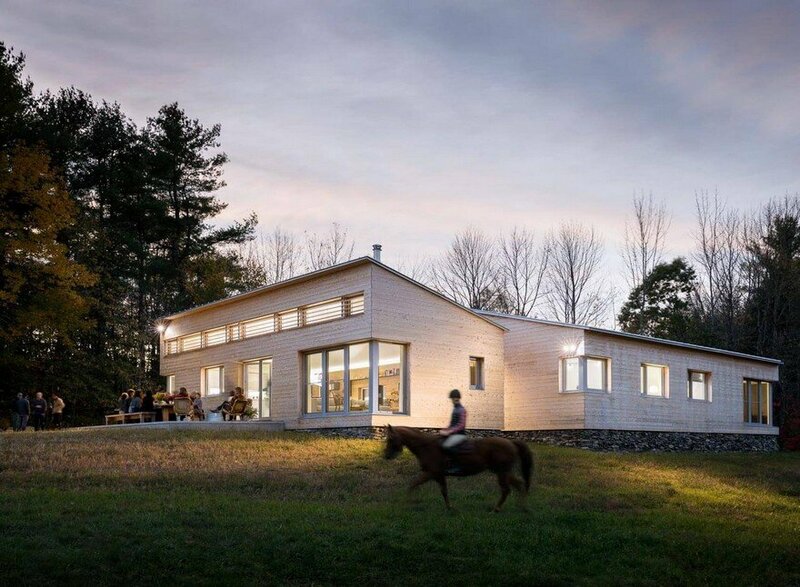 Description by architect: Designed for an active, outdoor-oriented couple, Maine Rural Modern stands on 10 acres of gently rolling pasture ringed by mixed woodland, a property it shares with a four-stall horse barn. 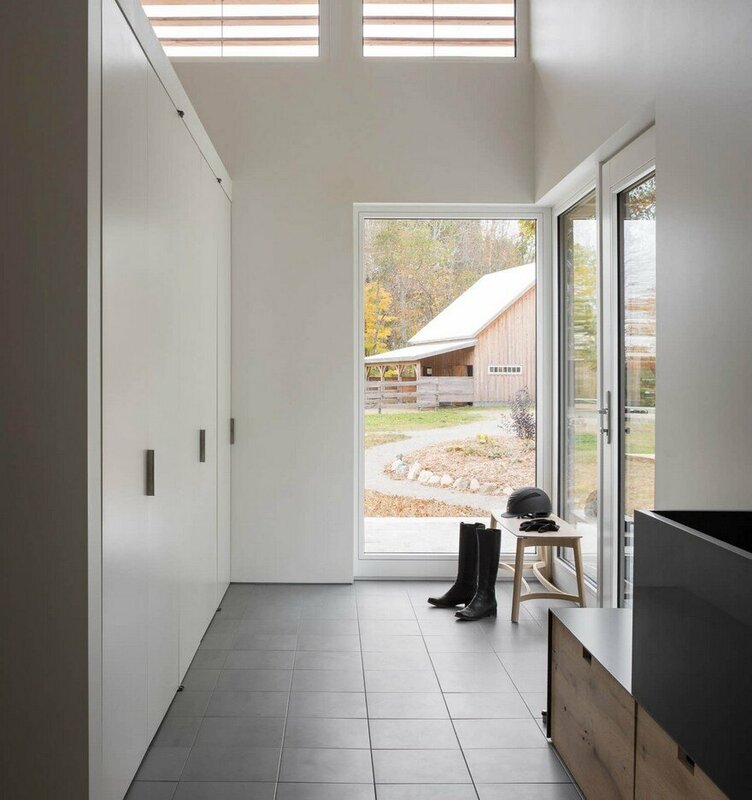 Reflecting both the character of the setting and its owners’ appreciation for contemporary architecture, the design applies modernist rigor—and Passive House principles of building performance—to the simple forms and rugged materials of the agricultural vernacular. 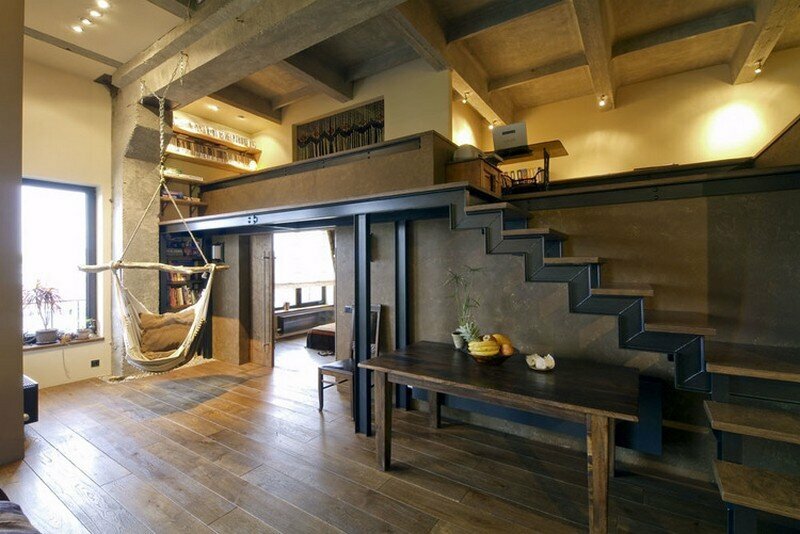 The result is a space- and energy-efficient house that matches practicality with architectural clarity. To preserve open outdoor space, the house hugs the property’s wooded northern boundary, facing south toward the barn and a wood-fenced paddock. The graveled main driveway brings guests to a casual dooryard at the front of the house, while an unobtrusive spur drive swings around to the rear, keeping the garage entrance and the owners’ parking area out of sight. 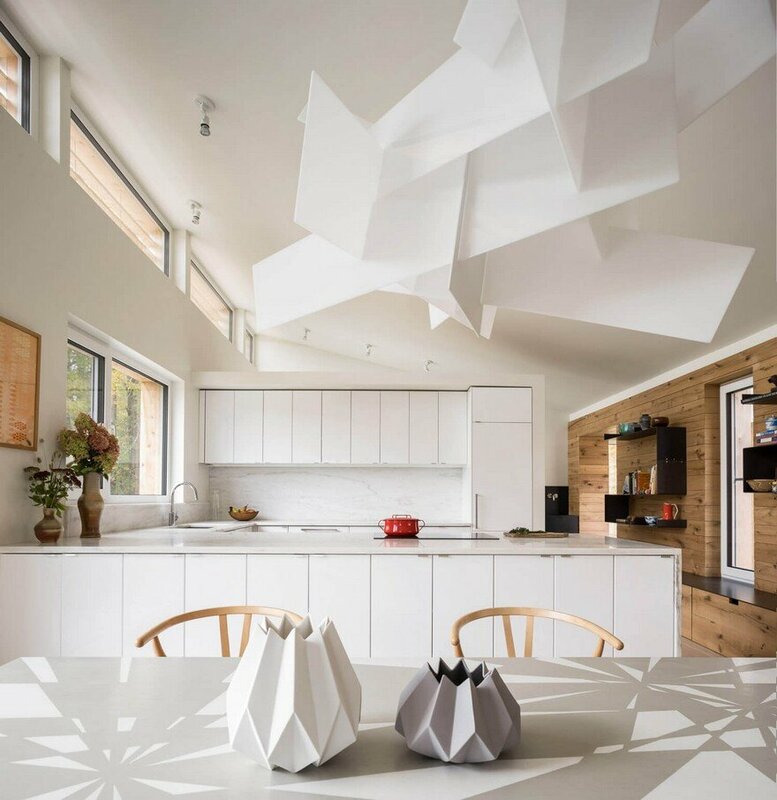 The building consists of three shed-roofed wings—one for living spaces, one for the three bedrooms, and one for the garage—separated by two glass-walled links. 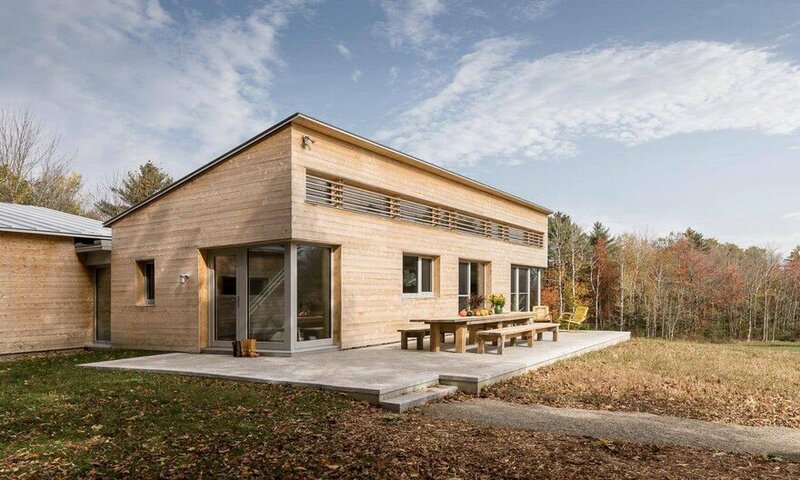 The forms are clean and contemporary, but their rustic exterior materials—cedar siding, fieldstone-faced foundations, and steel roofing—reflect the rural setting and the roughness of the adjacent barn. 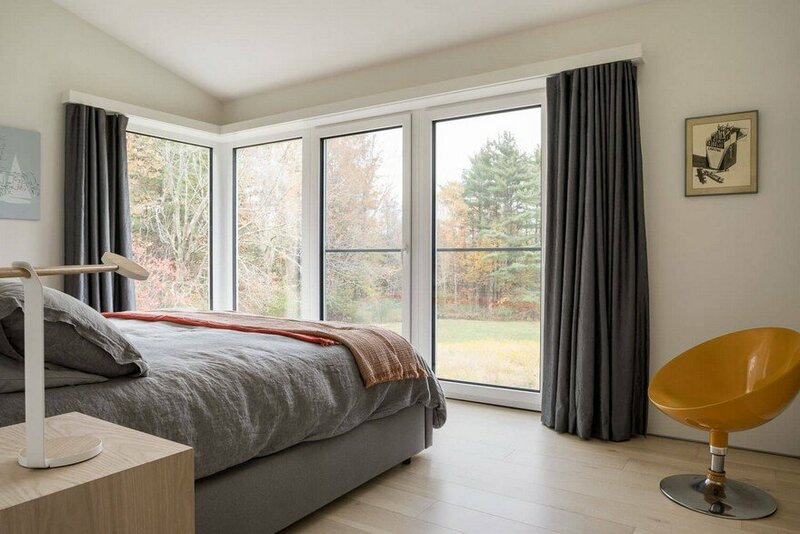 The foot-thick walls necessary for Passive House-level thermal insulation are evident at the deep window and door openings, lending a reassuring sense of shelter. An apron of local granite pavers spreads out to the south, creating both an entry sequence and an outdoor dining space. Inside, the house’s single-level floor plan is a model of modernist clarity, with each wing mapping onto a different set of functions. The long main wing stretches from east to west, encompassing the entry and a combined kitchen, dining, and living space. 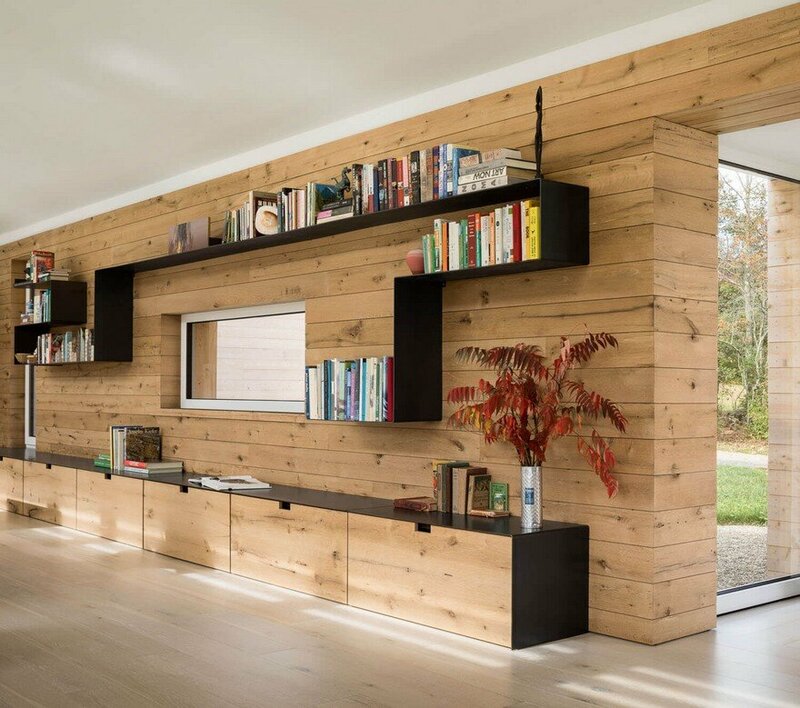 A high wall at the south opens toward views of the barn and paddock, and to capture the solar gain that provides much of the building’s heat. 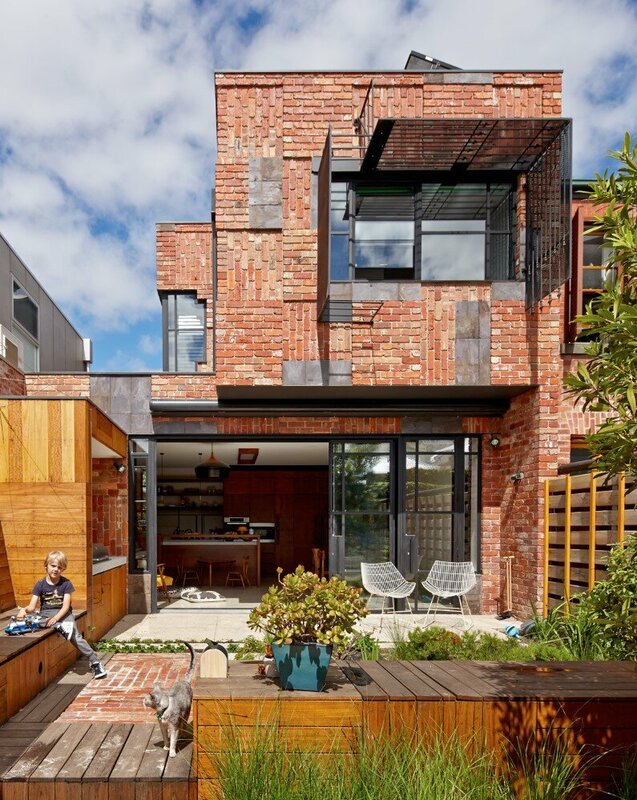 A band of clerestory glazing is shaded by a slatted cedar screen that blocks unwanted summer sun while admitting lower-angle winter rays. The bedroom wing projects toward the north from the living area. Its single-loaded corridor is located under the high side of wing’s shed roof, which gives it a height proportional to that of the living areas; a floor-to-ceiling door closes off the corridor for privacy at the master suite. The master bedroom and two guest bedrooms face east, toward the morning sun and views of the field and woods. 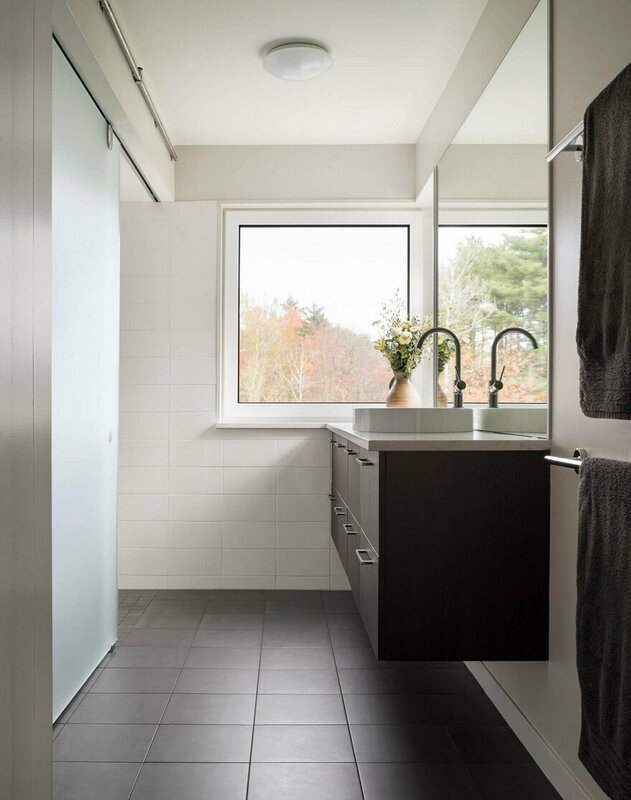 The guest bath includes a laundry closet, hidden behind a sliding barn door, and is convenient enough to the living spaces to obviate the need for a separate powder room. The garage wing is located at the building’s northwest corner, where it opens into the main entry. A simple palette of interior finishes reinforces the floor plan’s schematic simplicity, with white walls and ceilings backdropping every room. 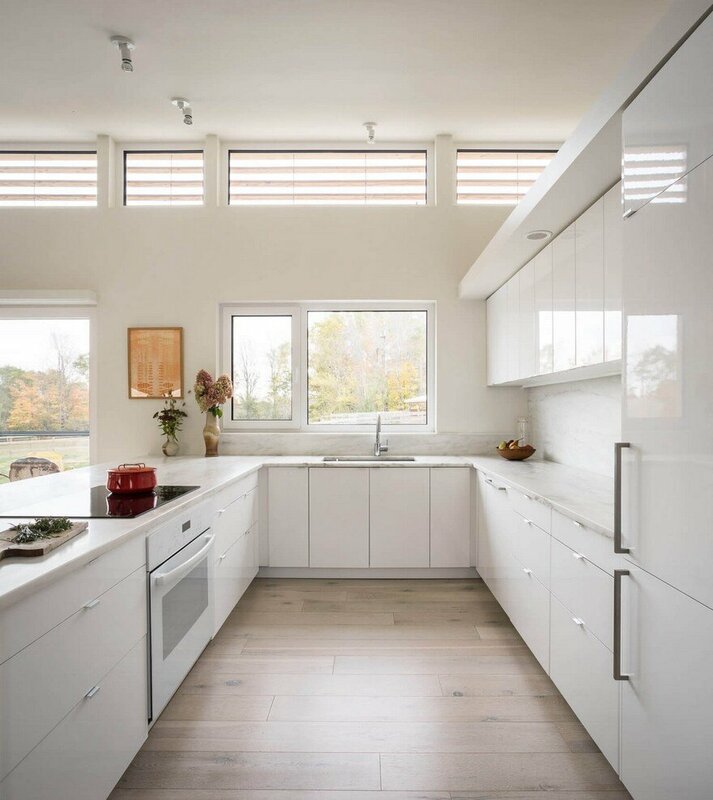 Flush-front white cabinetry and white marble countertops give the kitchen a bright, clean look that doesn’t distract attention from the dining and living areas. The accent, instead, is on the main wing’s north wall, which is paneled with reclaimed oak boards. 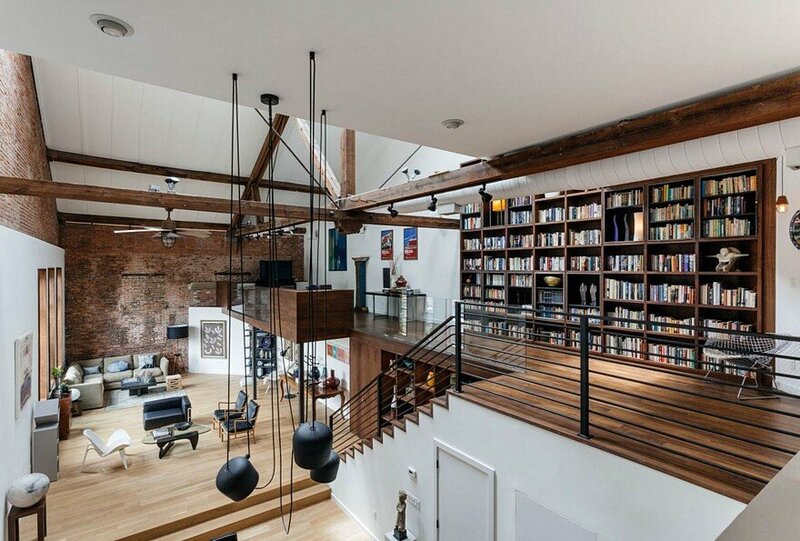 Detailed with blackened steel shelving and oak-and-steel storage benches that wrap into the living room and entry, this strong visual spine unifies the multifunction space. Atop the entryway bench rests a handsome black granite utility sink. 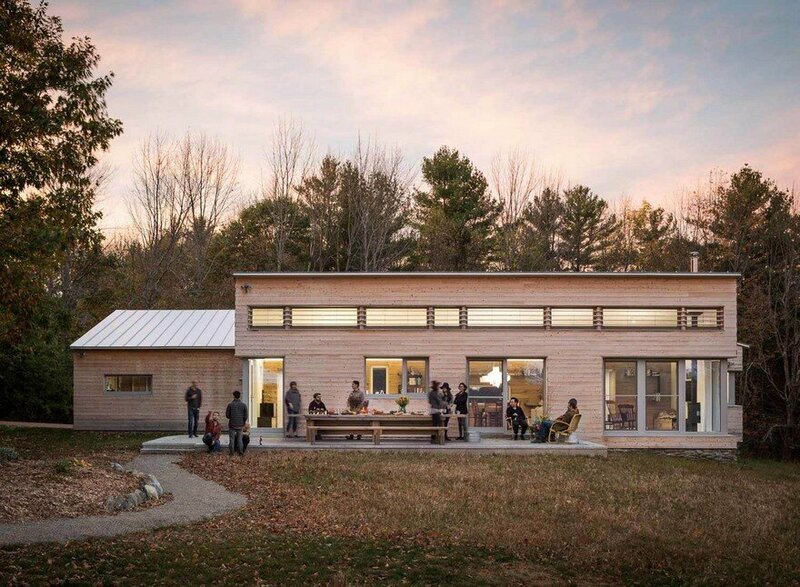 Like all GO Logic buildings, Maine Rural Modern follows the Passive House model of energy efficiency and indoor air quality, so its mechanical equipment consists primarily of a central heat-recovery ventilation system, a heat pump domestic water heater, and small electric baseboard heating units. 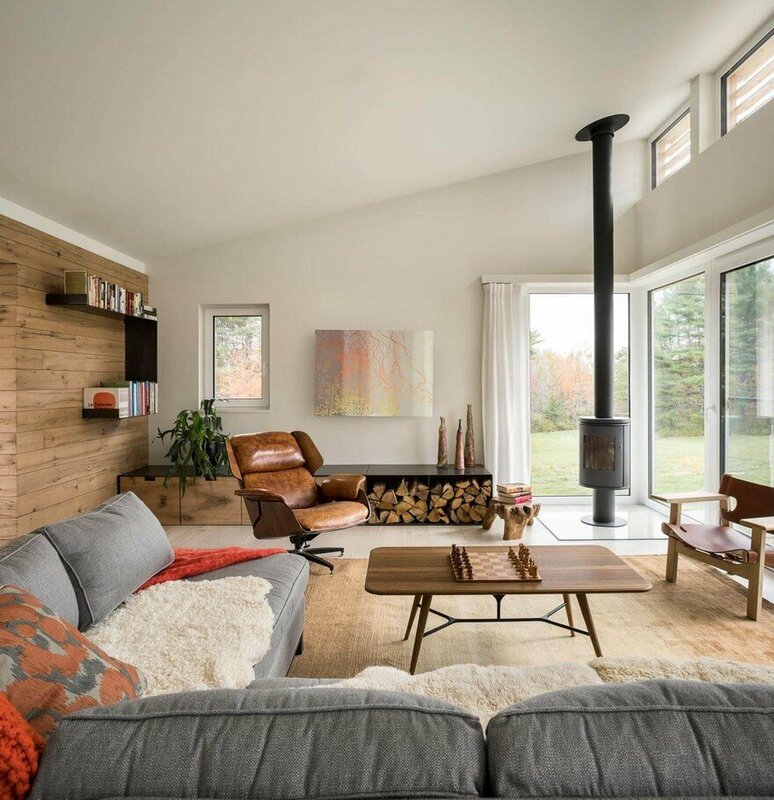 A wood stove provides ambiance, and an alternative heat source. 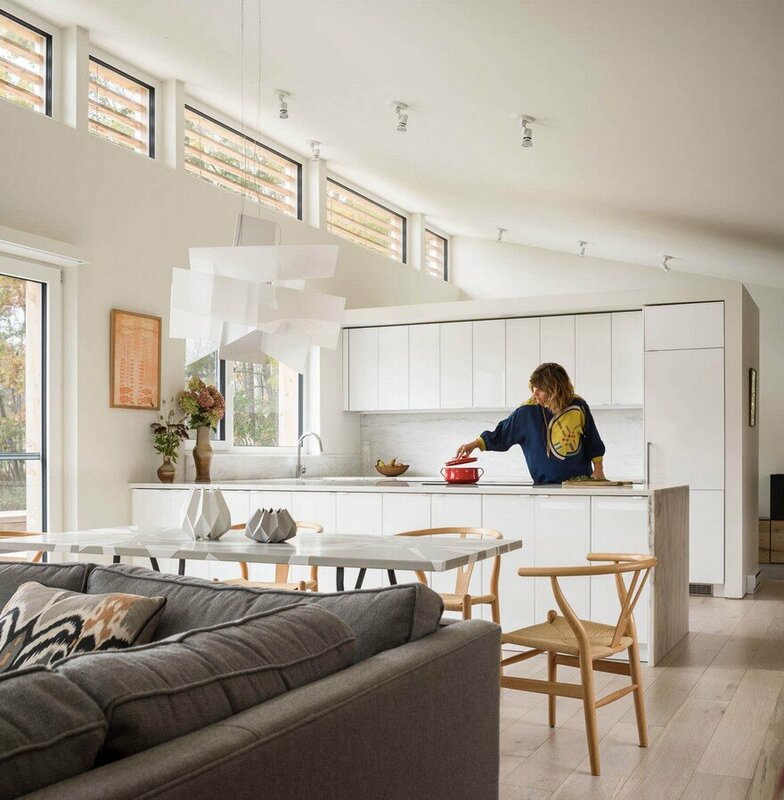 Thanks to the superinsulated building shell, high-performance triple-glazed windows and doors, and meticulous air-sealing, though, most of the space heating not supplied by the sun comes from incidental sources like the refrigerator and television—and from the occupants themselves.